The newest and easiest to play musical instrument ever! Received the harp today and to say that I love it is quite an understatement indeed. The craftsmanship and painstaking attention to detail show in every place I look on this instrument, and once I made sure it was in tune, it was truly an effortless transition from playing from the heart on a flute to playing on a harp. The music came so easily that I couldn't help but use it to record, since I had been planning on playing some 'get well' music for a friend earlier today. What better than to use than a brand new instrument? Attached is the piece I recorded for my friend, and if you would like to use it on your page as a demonstration of the Sensory Harp with standard tuning, you are more than welcome to do so! Tuned at the much desired 'Verdi' tuning (432 Hz.) to the key of C (chords C & Am) all the notes played by this harp will be perfectly in tune with each other. Play just a few strings or pluck individual ones, whatever you do you will make beautiful music that you will find relaxing, therapeutic and rewarding. The Sensory Harp can be used for healing through musical therapy and when played against the chest or on the lap, musical vibrations are felt throughout the whole body causing a feeling of well being. With the aid of an inexpensive chromatic tuner, the Sensory Harp can be tuned to four different scales. The 'Sensory' (Verdi - 432 Hz.) tuning will evoke a mood of introspection, reverie* and calm and is the standard tuning. The first of three other Blended Modal tunings is designed to center the body and refresh the spirit. The second to quiet the mind, soothe the nerves and assist in bringing sleep. It also works well when used to accompany a singer. 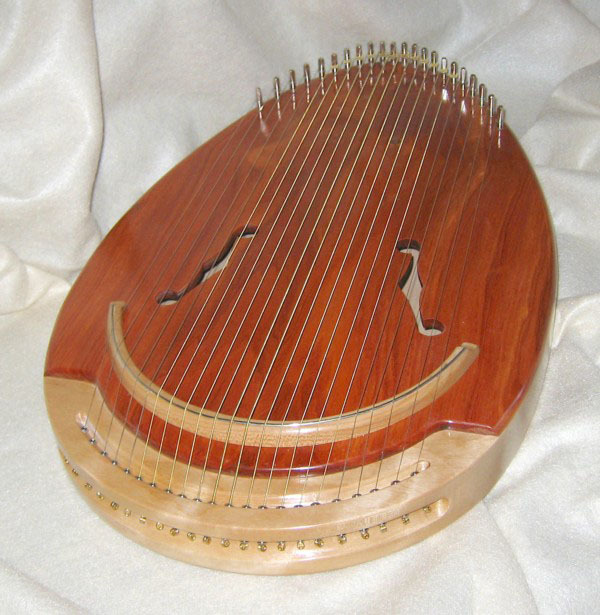 The third is an exotic tuning allowing the player or listener to journey into an imagined oriental setting. 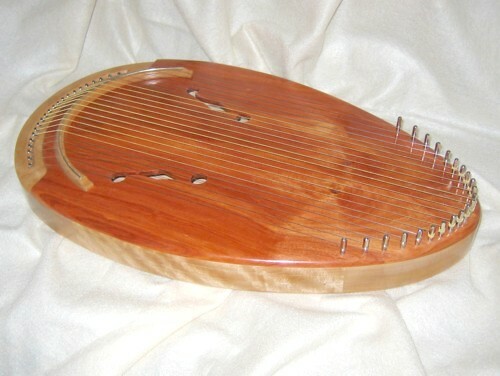 Unlike similar instruments of its kind, Sensory Harps are not made from kits and should not be compared to those that are. 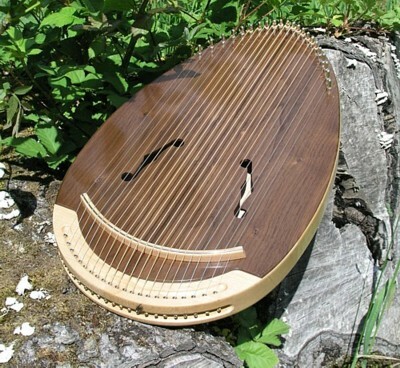 The major disadvantage of creating and selling 'kit' harps is that the instrument maker does not have full control over the choice and quality of the wood used. Each Sensory harp is created from scratch from optimum quality, individually selected pieces of the finest grade lumber so that the player not only has a beautifully sounding harp but also a piece of pristine artwork that can be displayed in the home or office with pride. 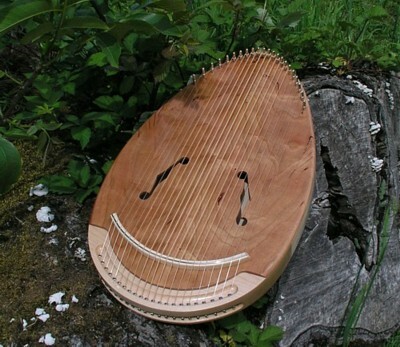 This beautifully created instrument is just 22 inches (approx.) in length and is designed to sit comfortably in the lap or up against the chest. In either position the vibrating strings can be felt entering the body. 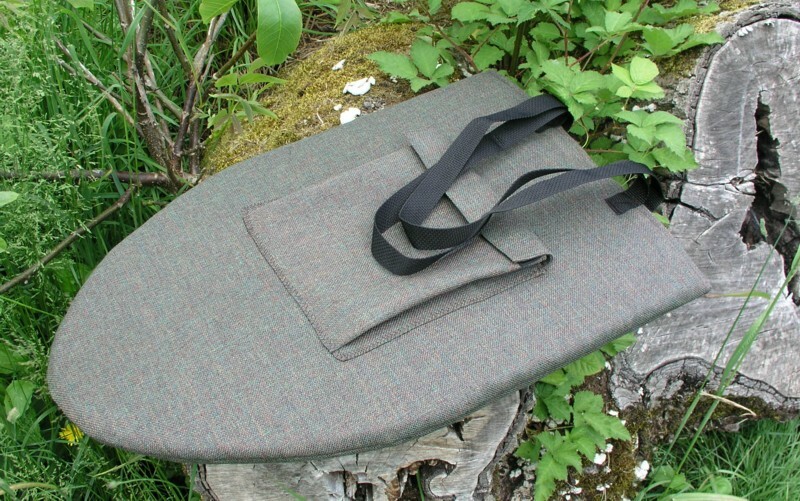 With the aid of an additional carrying case it is easy to take anywhere for any occasion. The basic model is crafted from Cherry with a Hard Maple bridge. The deluxe model can be created from woods of your choice. 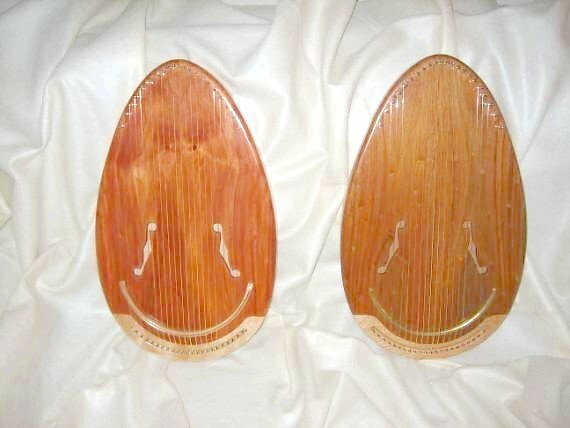 The harp shown left has a figured Maple shell with a book-matched Maple back and book-matched Tulipwood sound board. The bridge is also created from Maple. All hardware used in the creation of the Sensory harp is of the finest quality available! Left: Book-matched Tulipwood and Figured Maple harp. Right: Book-matched Jatoba and Figured Maple Harp. All instrument parts (except hardware) are created by Vance Pennington from the finest, selected woods that are hand cut, shaped and assembled in his studio in Oregon, USA. 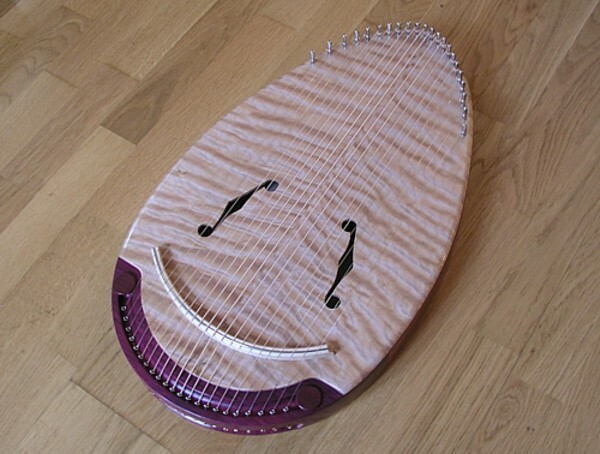 All harps come with a tuning wrench and pick (plectrum). As each harp is created from raw wood, selected for it's instrument and tonal qualities, the patterns in the grain will be different and unique to each harp. Please allow 4 - 6 weeks for the harps creation. 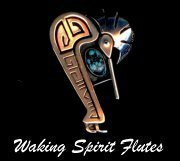 Please email (Waking Spirit Harps) for a special payment button which will include the correct shipping costs to your destination. Super Deluxe Harps - with figured Maple shell, book matched sound board and book matched Maple back.